For children, falling is a normal part of growing up and the consequence of a fall is usually little more than a skinned knee. 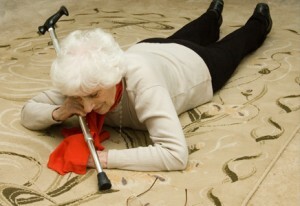 In elderly adults, however, falls again become common, though the injuries become more severe, with the most common fall-related injury being fractures. Nearly half of falls in young and middle-aged adults occurs while running, either for exercise or sport, or such situations as running to catch a bus. Other causes include neurological disorders, tripping, or impaired gait or balance which can be the result of intoxication or side effects of medication. In older adults, impaired balance or gait account for over 60% of falls, while running only accounts for a little over 10%. Because older adults are more likely to be on medication (and more of them), side effects are a common cause of impairments leading to falls. Other causes of falls in elderly adults include vision problems, arthritis and other painful conditions, muscle weakness, cognitive impairment, and drops in blood pressure when standing, known as postural hypotension. In any given year, approximately 18% of young adults will experience a fall. In middle-age, the number rises slightly, to 21%. Over the age of 65, the rate rises to one out of every three, while half of all adults over age 80 will experience a fall this year. As many as 80% of falls are never reported to healthcare providers, as they either do not result in injury, or any injury is minor. Among younger adults, the most common fall-related injuries are sprains and bruises. Only about 7% if injuries due to falls is a fracture. In elderly adults, the number triples to 21%. The average 50 year old man has 11% risk of fracturing a hip sometime during the remainder of his life, while the risk for a 50 year old woman is as high as 22%. Half of all people who suffer hip fracture are never able to fully regain their ability to walk, while 20% will die within six months. We know how important the inner ear is for balance, but it’s only one part of the picture. The inner ear senses position and angle of the head and sends this information to the brain. However, the eyes need to be able to perceive hazards, the brain needs to be able to process the information, and the nervous and musculoskeletal systems must be able to use the information to keep the body upright and send feedback from the feet, knees and hips back to the brain. Though elderly adults are more vulnerable to falls and fall-related injury does not mean that falling is an inevitable part of growing old. From assistive devices to monitoring and adjusting medications, there are a number of things that can be done to help prevent falls and give elderly adults more confidence and independence. Chiropractic care can also help significantly reduce the risk of falls in people of all ages, but especially in elderly individuals. Chiropractic care can help improve mobility and gait, ease arthritis and other degenerative conditions, and potentially reduce the need for medication. By manipulating the spine and associated muscles, joints, and tissues, a chiropractor can correct misalignments and loosen up muscles. As a result, the patient is both able to move more freely, and gains better body awareness. If you have suffered a fall, if you have experienced dizziness, or if you have risk factors that increase your likelihood of a fall, call Eastern Chiropractic now on 9857 4503 to schedule an appointment to find out how chiropractic may be able to help you feel more confident and regain your independence.